That’s where the nVsita system comes in. 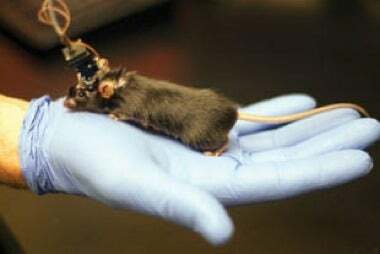 It’s a miniature microscope, just one inch long, that is mounted directly on the head of an adult mouse, along with a mobile phone camera (a mini CMOS image sensor) and a light source. It’s now common practice to genetically modify a particular type of neuron in mice to light up (fluoresce) in response to increased brain activity. That fluorescence gets brighter the more active those neurons are, and this light is picked up by the mini-microscope and recorded by the camera. The nVista is light enough (roughly the weight of four cotton balls) that the animal can go about its business quite naturally, while still allowing researchers to monitor brain activity in real time. It can track up to 1,000 individual neurons simultaneously. One researcher who has found the system useful is Garret Stuber, a neuroscientist at the University of North Carolina, Chapel Hill. Last year, he and several colleagues published a paper in the journal Cell reporting how they had imaged the activity patterns of individual brain cells in mice as the animals foraged for food. This let them link particular behaviours to specific neurons.